The Pink fabric is Tina Givens from her Treetop Fancy line and the Yellow fabric is Anna Marie Horner from her Garden Party line. Everything else is just scraps I had laying around which would probably be mostly Amy Butler, Anna Marie Horner, and Sandi Henderson among others. Oh, and I just realized that you can see the beds the girls used to be in too! Particularly Big's bed. Not everyone will agree, but I like her new bed better. . . :) Can't wait to show it to you!!! I realized this weekend that I have never given you the pictures of Little Sister's quilt. So, sorry for the delay, but here they are for your viewing pleasure! I don't see why the back of a quilt has to be just a solid piece of fabric, so I had fun with the other side as well. 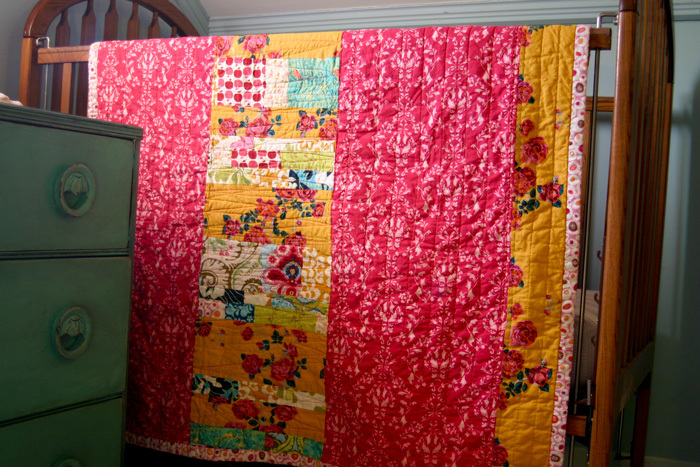 Now, I'm not sure which side I like best and should call the "front"
I love the way it turned out and how it goes with Big Sister's quilt, but isn't matchy-matchy. The girls share a room now, but probably won't in our next house, (No, no current plans on that) so it's nice that they look good together, but if they are ever put in separate rooms, it won't feel or look like we broke up a set. Older PostToddler Pallet Bed 2 Completed!